Finding the right centerpiece can be hard and time consuming. It’s also the focal point of your table where that is the dining table where your having dinner, the dessert bar or on the kitchen island to add a little festive touch to your home. We found the perfect solution for you!!!! It’s easy and fast… we don’t want the centerpiece to take too long…. you have things to bake and get ready for your Easter celebrations. All you do is buy carrots that still have the stem on them. 2. Find your vase and have it washed. 4. Set a towel right in front of your tub/sink and laid the carrots out and put a towel on top. Pat dry. 5. Place the carrots imperfectly so they overlap and hold each other up. 6. Fill with cold water and that is it. You’re done! 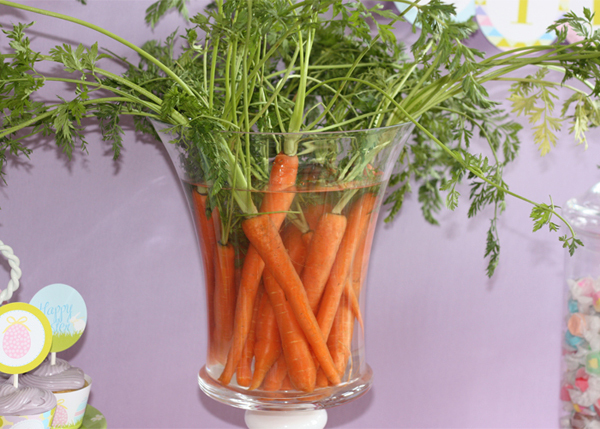 Here are a few trade secret to perking up your carrots to make them show worthy! Are your ready…..
*completely immerse your carrots in COLD water, and I mean really really cold water. *lay the carrots completely flat – If you have a large sink that the carrots and stems can lay flat your in luck, if not you can use your bath tub. Fill with the COLDEST water you can and then throw in a couple buckets of ice and your leaves will start perking up. Leave in for 10 minutes or so. Nice centerpiece idea!! 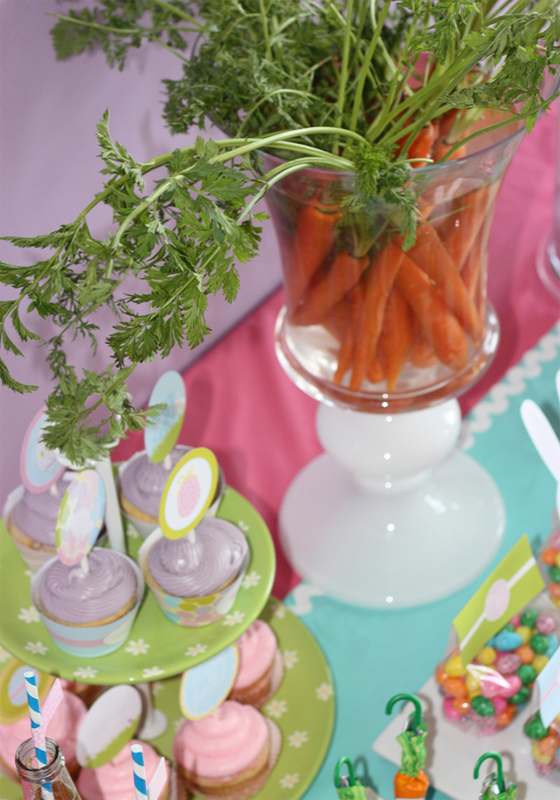 The carrots could even be eaten as part of the dessert table! Thanks for the tips! Love this post. Had to share with my FB friends at http://www.facebook.com/4youngdesigns because I know my busy mom readers will love the edible centerpiece! OMG…Gonna have to try that chocolate bowl!! !